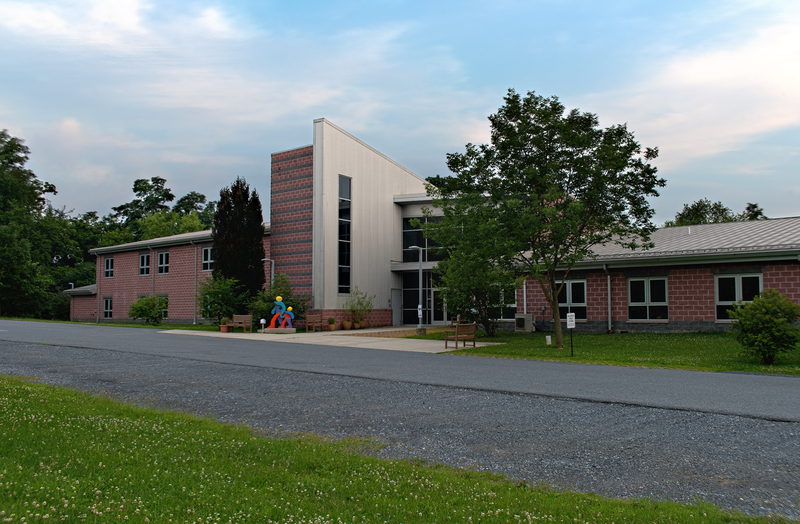 The Londonderry School campus was completed in the spring of 2004 after 10 years of fundraising, planning and construction. We selected this site because it afforded us a beautiful nature observatory within minutes of the capitol complex and downtown Harrisburg. We knew, however, that we would need to be stewards of these 14 acres. And so we began planning a school building and grounds that would preserve natural habitat, protect the watershed, reduce waste, reduce energy usage, and teach others about caring for our environment. As part of our planning, we strove to meet the national building standards set by Leadership in Energy and Environmental Design (LEED) in areas such as site development, air quality, energy efficiency, water conservation and innovative design strategies. Further, we committed our project to show that environmentally conscious or “green” building construction does not need to cost more than traditional construction and should become a new building industry standard. Typical central Pennsylvania school construction cost is $130/sq. ft. Our building was constructed at about $100/sq. ft., demonstrating that green design can be cost effective and within reach for any construction project. We also made design decisions to create a building that is a teaching tool about the environment for our students and for public visitors. As you walk around our building you can learn about the choices we made and why we made them, keeping both the environment and cost in mind. We have reduced energy usage through the coordination of the systems in the structure. First, the building envelope has extreme insulation – an R-60 roof and R-48 walls. Walls are made of double walls of Styrofoam that make a form that is filled with concrete. The highly insulated envelope of the building keeps heat and cooling inside the building. The floor slab of concrete is heated by radiant tubing – 130-degree water snakes through the floor in tubes spaced 12 inches apart. The concrete remains warm and the individual areas do not need to call for heat as often as with traditional baseboard or forced hot air heating. The upstairs level uses baseboard heat, but relies on heat rising from the floor below for primary heating. Windows allow for passive warming from sun. Utilizing the sun’s warmth, through windows and clerestories, helps warm the building through the day. Roof overhangs are designed to keep summer sun out and let winter sun in. Awnings over some windows provide the same effect. Awnings were purchased from Conservation Concepts, an environmental business with ties to Londonderry’s founding families. All classrooms have individual heat thermostats so each can be regulated as needed, depending on the amount of sun warmth. The building is designed to reduce the need for air conditioning by using natural air ventilation in classroom wings with purge fans. These fans pull cool air through the classrooms at night when windows are left open. Clerestories allow heat that rises, to escape. Only the central part of the building is air conditioned, as this is the only part of the building getting year-round use. Offices are air conditioned separately from the multipurpose room/lobby area, so that only the area in use can be air conditioned. This design has a two-fold economical advantage: reduced building costs and reduced ongoing operating costs. Day-lighting, or using natural light as lighting, reduces demand for lighting and provides a more pleasant natural light. With large windows in each classroom, white ceilings reflect and spread light throughout. Clerestories add light to hallways. In turn, light in the halls is reflected off white ceilings and into classrooms through openings in the walls. The gang sinks, which were recycled from a building demolition, turn off automatically and have small faucet holes, so children cannot leave water running. The entire School property produces no water run-off. Building materials were made from rapidly renewable/fast growth materials, or recycled/recyclable materials. Wheatstraw board, a rapid growth material, is used in the multipurpose room and over doorways. Another is bamboo, used for the multipurpose room flooring. Interface brand carpet is made from recycled carpet and is recyclable when no longer needed, including both fibers and backing. Because the carpet is installed in squares, rather than an entire roll, each square can be replaced singly as necessary when soiled permanently. 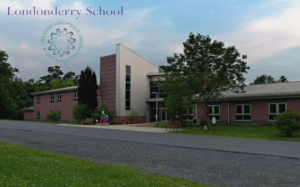 Approximately 75% of all waste involved in the construction of the Londonderry school was recycled! New furnishings would have cost approximately $150,000. Assorted classroom and office furnishings, were retained from our former school location. Lobby and administrative furnishings were donated by two law offices and two corporations that were disposing of furnishings. Savings to school amounted to $136,000. Large sinks were donated from a demolition site and refurbished. River stones from another demolition site were repurposed for exterior walkways. Indoor and outdoor materials were selected to require little maintenance and refinishing. Split-faced block is used on the exterior. Inside, regular concrete block is used in hallways requiring no re- painting in later years. Concrete flooring is easy to maintain and requires little upkeep. When considering the impact on the environment in material selection, the travel distance of the materials coming to the site was a factor. Materials were selected that were made within a 500-mile radius of the site. New classroom furniture was purchased from a Lancaster, PA company. Londonderry students engage in hands-on organic gardening from their first days of pre-school though their graduation from 8th grade. Gardening enables students to understand the source of fresh food; the process of plant growth; the need to nurture living things; and the connection between nutrition and good health. Younger students harvest greens and prepare salads to enjoy with lunch. Middle school students have discovered recipes, prepared, and sampled roasted root vegetables with fresh herbs, some for the first time. Through the process of composting scraps from the fresh produce grown at school and packed in their lunches, they learn how to fertilize their gardens while reducing waste. Students water their gardens using the school’s rain barrels. They not only have fun growing their own fruits and vegetables in their school’s backyard but they learn that they can directly contribute both to their own heath as well the health of the environment. Only the area needed for construction itself was disturbed. Trees were saved that were healthy, rather than leveling the entire area and re-planting later, as is typical in commercial and school construction. Summer days aren’t lazy at Londonderry’s Backyard Summer Camp. Children ages Pre-K (4) through 6th grade enjoy tending and harvesting the gardens, cooking, exploring and building structures in the wooded areas of the playground, creating crafts, dancing, playing games, and making new friends. Certified teachers weave cross-curricular learning opportunities into hands-on activities and play. Weekly yoga, STEAM, and music classes are highlights. Pizza picnics are a Friday treat. To paraphrase one of the school’s founders, “Children will want to protect nature as adults when they have directly experienced nature as children.” At Backyard Summer Camp, staff takes every opportunity to help children develop their appreciation for the natural world. Whether composting, admiring visiting owls, growing seeds or dodging raindrops in bathing suits as part of water play, children joyfully connect with their environment every day.